A good, but not great, jobs number managed to spark healthy gains on Wall Street Friday. The government's monthly report showed the economy added 175,000 jobs in May, more than the 158,000 economists had expected. The unemployment rate edged up to 7.6% from 7.5% in April. The Dow Jones industrial average rallied more than 200 points, or 1.4%. The S&P 500 and Nasdaq rose 1.3%. Friday's gains helped push the major indexes into positive territory for the week, following two straight weeks in the red. The Dow and S&P 500 gained 0.9% and 0.8%, while the Nasdaq ticked up 0.4%. The Dow and S&P 500 are about 2% from the record highs they hit last month. European markets followed U.S. stocks and closed sharply higher. 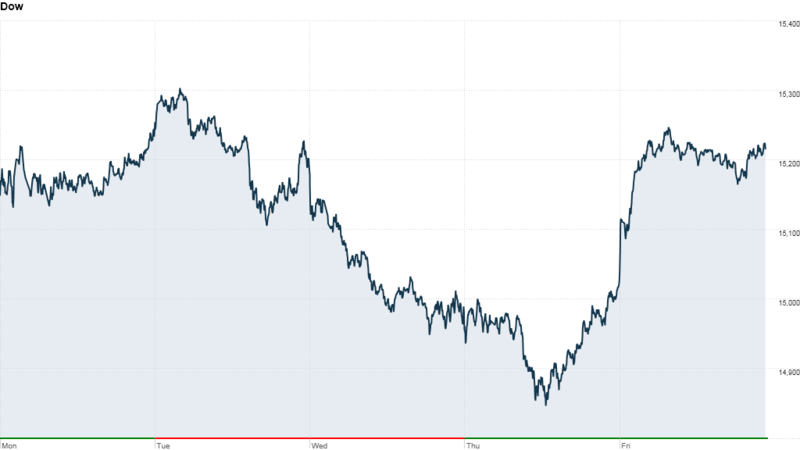 But stocks have been volatile recently, as investors grapple with concerns about when the Federal Reserve might start to cut back on its stimulus efforts. What the jobs number means for the Fed: The monthly jobs report is always a big focus, and of particular importance this time around as investors question how long the Fed will continue its bond-buying program in the face of an improving economy. Fed chief Ben Bernanke has said that the Fed will begin pulling back on its stimulus monetary policies when the job market shows sustainable improvement. "Today's report is perhaps the perfect number for nervous investors," said James Marple, senior economist at TD Economics. "It is strong enough to point to continued economic recovery, but not so strong as to bring forward expectations of Fed tapering." Brad Sorensen, director of market and sector research for Charles Schwab, echoed Marple's comments, saying the number fell in the "sweet spot" that takes the possibility of Fed tapering off the table for now. What's moving: Shares of TiVo (TIVO) plunged almost 20% after the company settled a patent infringement battle with Google's (GOOG) Motorola Mobility unit. Wal-Mart (WMT)rose after the world's biggest retailer announced a $15 billion stock buyback program at its annual shareholder meeting. Shares of Amazon (AMZN) jumped after the online retailer began selling the Kindle in China. Samsung sinks: No winners in mobile? Samsung (SSNLF) shares tumbled in Korea as investors worried about slowing sales of the Galaxy S4 smartphone. Future sales could come under even more pressure if rival Apple (AAPL) announces a trade-in program as reported by Bloomberg. Japan briefly dips into bear market territory: Asian markets ended the day with losses. Japan's Nikkei index retreated again, at one stage entering bear market territory by extending losses since its May 23 peak to more than 20%. It recovered slightly later in the session to end 0.2% down for the day. The major indexes in Hong Kong and mainland China fell by just over 1%.